Protecting family unity and ensuring our public policies address the concerns of immigrant families. 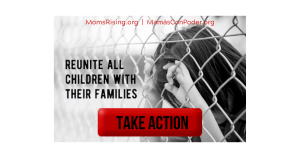 As part of MomsRising’s mission to advocate for economic security for all families living in the United States, we have reached out to our million members and developed education campaigns to build public will for fair treatment of immigrant children, mothers and families. Our intent is to further a constructive national dialog on reforming our country’s immigration policies so that they reflect our values as a nation and allow for all families to contribute to our culture and economy. Tell Congress and U.S. Secretary of Homeland Security Kirstjen Nielsen to #KeepFamiliesTogether! Tell Director L. Francis Cissna: Don’t rewrite U.S. history by erasing the contributions of immigrants to our nation! Just last week, President Trump’s U.S. Citizenship and Immigration Services (USCIS) Director L. Francis Cissna announced that the agency changed its mission statement and the positive contributions of immigrants to our country are quite literally being deleted -- and as that was done so was “America’s promise.” The USCIS is sending a message to our communities that rather than being a nation of immigrants, we are a nation that needs to be protected against immigrants and we can't stand by and let that happen. 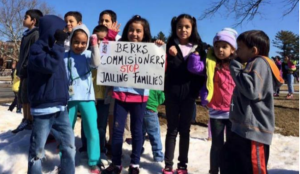 Raise your voice to Shut Down Berks! Babies in detention in Pennsylvania? Not OK. Join us to tell the Governor to Shut Down Berks! We must stand up for pregnant immigrant moms!